Whether you are looking for a simple sun shade or a stylish cantilever parasol, we are sure to have the parasol for you. Choose from our multitude of colours, styles and designs and benefit from our top quality garden umbrellas. Also, good to hide under from a rain shower, our garden brollies have lots of uses. 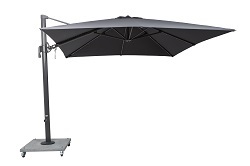 Selected from top brands including Norfolk Leisure, you can rely on our parasols being top quality.